You can use conditional breakpoints that you want to set a breakpoint that is active for a specific condition only. Normally breakpoints will stop the execution of ABAP Program on specific line. It may makes very hard to check the status of variables when loop is repeated a large number of times, so you can create conditional breakpoint to stop on certain condition within loop. 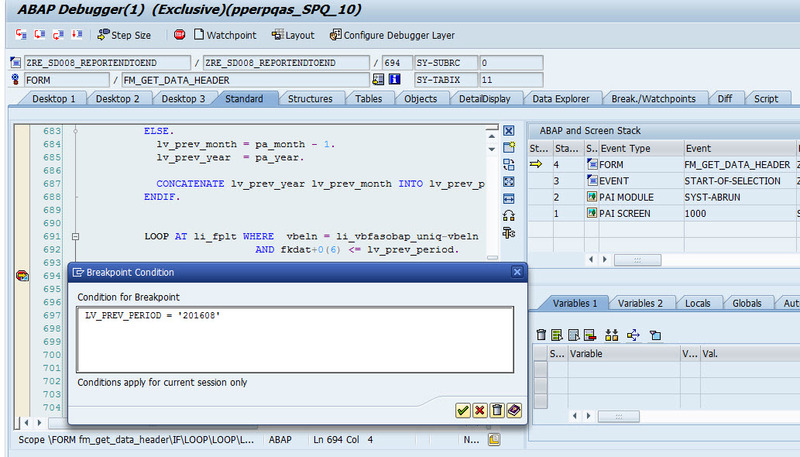 After setting a breakpoint in ABAP Source code, you can specify condition for a breakpoint in ABAP Debugger by right-clicking on the breakpoint and select CREATE BREAKPOINT CONDITION. Breakpoint conditions are valid only for debugger breakpoint, If you save a breakpoint as session or external breakpoint, the breakpoint condition won’t be saved.